2012 Porsche 911: Somebody Call 991! A chatty yet anonymous Jalopnik reader caught this mini-parade of taped-up Porsches (including a facelifted Boxster) running through the streets of Beverly Hills. Is the 991 (or 998 depending on who you talk to) getting some botox? For years, Porsche enthusiasts have rumbled that Stuttgart was working on a Carrera-based Supersport 911 with a whale tail that would carry the 998 name. Based on the booty tail cover, quad exhausts and turbo whine, you'd think that car was the caboose on this convoy. Our sources tell us it's not. Instead, what you're seeing is the camouflage on the next 911 turbo. Porsche has to make it bigger than the actual wing because the Turbo wing moves. That makes sense. So why was it tooling about on the streets of Beverly Hills? Likely because hot weather testing went on in Death Valley last week. These Porsches could be being driven back to the port for shipping. 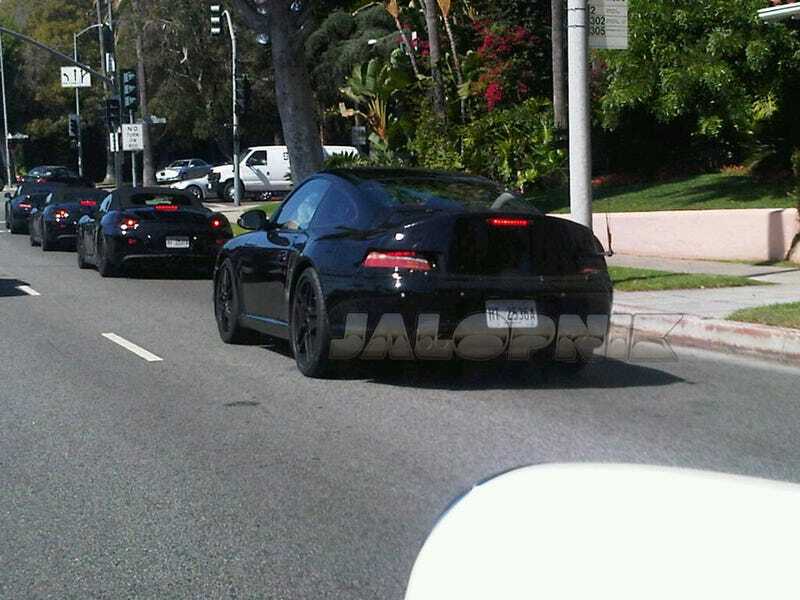 What we do know is at least one of the leading cars is a Boxster with some strategically placed tape and no badges. But, although it was spotted in L.A., thanks to the recent release of the new Spyder, our best guess is we won't be seeing the latest facelift for that particular star in time for the L.A. Auto Show.